Height adjustable, high-grade aluminium walking stick with tripod base and palm shaped handle. The base swivels ensuring that the base is firmly placed on the ground irrespective of the angle of pressure or angle of the surface. Built-in shock-absorber provides cushioning at every step. 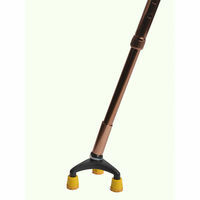 The handle, shaped to fit the palm provides superior grip and comfort. 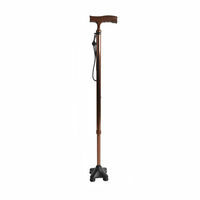 For regular use, for people with minor balance issues and weak legs. 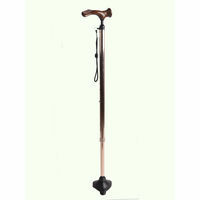 Height adjustable, high-grade aluminium walking stick with tripod base and palm shaped handle. The base swivels ensuring that the base is firmly placed on the ground irrespective of the angle of pressure or angle of the surface. Built-in shock-absorber provides cushioning at every step. 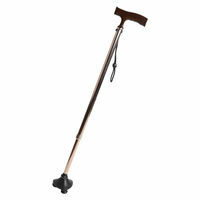 The handle, shaped to fit the palm provides superior grip and comfort. For regular use, for people with minor balance issues and weak legs.